Stepping into the West Wing at the Aquarium, most people’s first instinct is to go directly for the new shark and ray touch tank. That’s totally understandable, because who doesn’t want to touch some awesome cartilaginous fishes?! However, just running for the touch experience will make you miss out on some really cool animals in this area. When you first come in, on your right, you’ll find our new mangrove exhibit. This exhibit is home to some awesome animals, one of my favorite being the pink and yellow sea cucumber (Pentacta anceps). P. anceps amongst the mangroves. Sea cucumbers are echinoderms (which means “spiny skin”) and are relatives of sea stars and sea urchins. They have a pretty interesting feeding technique. This species feeds by extending its pink and yellow tentacles to catch particles drifting in the water, pull those tentacles back in to get the food off of them, and then repeat this process as needed. 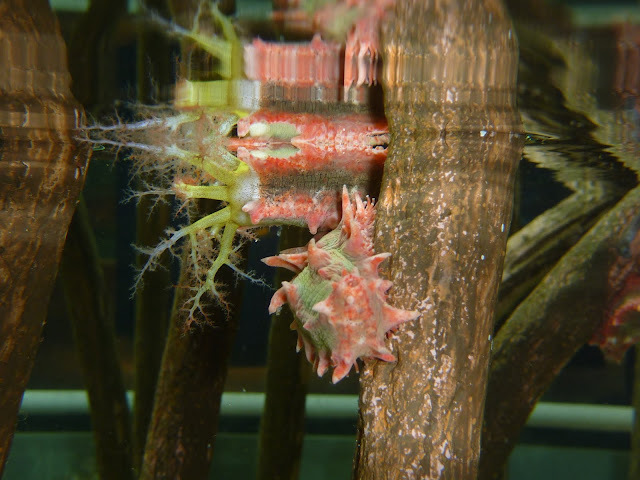 Not all sea cucumbers feed this way. Many sea cucumbers consume sediment and extract the edible algae, bacteria and nutrients before expelling the unconsumable part. 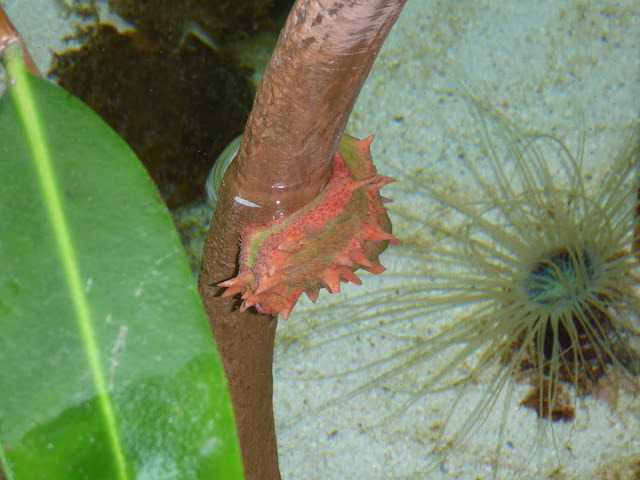 Most sea cucumbers are pretty mobile, but this species seems to be pretty content to stay put once it finds a location with enough water flow to support its nutritional needs. So, if you look on the mangrove roots, you should be able to spot a couple of these brightly colored animals. P. anceps extends its feeding tentacles into the water flow. Since this species is naturally found in the Indo-Pacific, you won’t get much of a chance to see this locally. So, be sure not to miss it on your next trip to visit the shark and ray touch tank!